This is one of my favorite classic computer game tunes, composed by Martin Iveson for the Jaguar XJ220 game on Amiga back in the early nineties. I grew up playing this game on our neighbours’ Amiga 1200, in what remains an intense childhood memory. The smell of the computer, the sound of the loading floppy discs and the excitement of us promising young race car drivers tucked into a small boys room, it all feels palpable to this day. Being born in 1986, I feel privileged to have grown up during the still primitive phase of the computer age, long before touch screens, crisp graphics and social media entered the scene. To me the pixelated computer images from my childhood have a strange beauty to them which can never be rivaled by today’s crystal clear ipad graphics. I guess it’s related with the limitations of the format, the low screen resolution and the limited colour palette. The limitations create a restricted stylistic framework, much like in traditional woodcut, silkscreen printing and stencil graffiti. It seems to me that the chances of succeeding in making something beautiful increases with the restrictions, perhaps making you less likely ending up in some stylistic blind alley. Pixel artist Jim Sachs is an artist who stuck to his restricted medium even when the times changed – He still makes old school pixel art in the iPad era. A former American Air Force pilot, he got involved with the fledgeling computer and gaming industry in the early eighties. He started writing games for the Commodore 64, then got involved in the development of the Amiga (Commodore’s legendary gaming computer). His computer art from the late eighties and early nineties must be among the greatest achievements within the realm of pixel art. 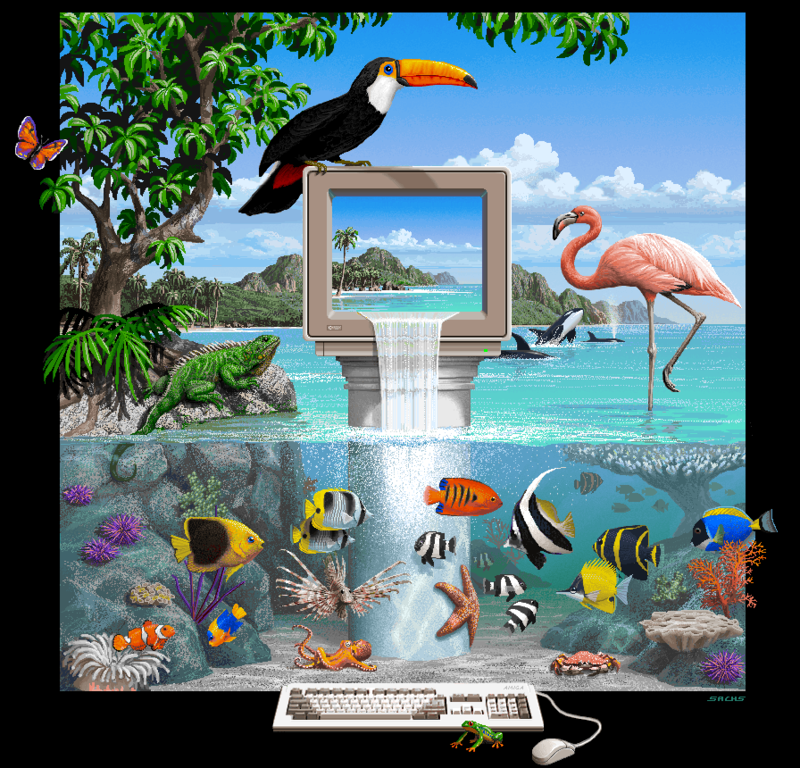 My first encounter with his amazing artwork was on my neighbour’s Amiga sometime in the early nineties, in the form of a desktop background called “Amiga Lagoon” (seen below).